Dune is a science fiction media franchise that originated with the 1965 novel Dune by Frank Herbert. Dune is frequently cited as the best-selling science fiction novel in history. It won the 1966 Hugo Award and the inaugural Nebula Award for Best Novel, and was later adapted into a 1984 film and a 2000 television miniseries. Herbert wrote five sequels, and the first two were presented as a miniseries in 2003. The Dune universe has also inspired some traditional games and a series of video games. Since 2009, the names of planets from the Dune novels have been adopted for the real-world nomenclature of plains and other features on Saturn's moon Titan. Frank Herbert died in 1986. Beginning in 1999, his son Brian Herbert and science fiction author Kevin J. Anderson published a number of prequel novels, as well as two which complete the original Dune series (Hunters of Dune in 2006 and Sandworms of Dune in 2007), partially based on Frank Herbert's notes discovered a decade after his death. The political, scientific, and social fictional setting of Herbert's novels and derivative works is known as the Dune universe, or Duniverse. Set tens of thousands of years in the future, the saga chronicles a civilization which has banned all forms of computers, or "thinking machines", but has also developed advanced technology and mental and physical abilities. Vital to this empire is the harsh desert planet Arrakis, only known source of the spice melange, the most valuable substance in the universe. Due to the similarities between some of Herbert's terms and ideas and actual words and concepts in the Arabic language—as well as the series' "Islamic undertones" and themes—a Middle Eastern influence on Herbert's works has been noted repeatedly. Herbert's interest in the desert setting of Dune and its challenges is attributed to research he began in 1957 for a never-completed article about a United States Department of Agriculture experiment using poverty grasses to stabilize damaging sand dunes, which could "swallow whole cities, lakes, rivers, and highways." Herbert spent the next five years researching, writing, and revising what would eventually become the novel Dune, which was initially serialized in Analog magazine as two shorter works, Dune World (1963) and The Prophet of Dune (1965). The serialized version was expanded and reworked—and rejected by more than 20 publishers—before being published by Chilton Books, a little-known printing house best known for its auto repair manuals, in 1965. Dune won the 1966 Hugo Award and the inaugural Nebula Award for Best Novel. The novel has been translated into dozens of languages, and has sold almost 20 million copies. Dune has been regularly cited as one of the world's best-selling science fiction novels. A sequel, Dune Messiah, followed in 1969. A third novel called Children of Dune was published in 1976, and was later nominated for a Hugo Award. Children of Dune became the first hardcover best-seller ever in the science fiction field. In 1978, Berkley Books published The Illustrated Dune, an edition of Dune with 33 black-and-white sketch drawings and eight full color paintings by John Schoenherr, who had done the cover art for the first printing of Dune and had illustrated the Analog serializations of Dune and Children of Dune. Herbert wrote in 1980 that though he had not spoken to Schoenherr prior to the artist creating the paintings, the author was surprised to find that the artwork appeared exactly as he had imagined its fictional subjects, including sandworms, Baron Harkonnen and the Sardaukar. In 1981, Herbert released God Emperor of Dune, which was ranked as the #11 hardcover fiction best seller of 1981 by Publishers Weekly. Heretics of Dune, the 1984 New York Times #13 hardcover fiction best seller, was followed in quick succession by Chapterhouse: Dune in 1985. Herbert died on February 11, 1986. Over a decade after Herbert's death, his son Brian Herbert enlisted science fiction author Kevin J. Anderson to coauthor a trilogy of Dune prequel novels that would come to be called the Prelude to Dune series. Using some of Frank Herbert's own notes, the duo wrote Dune: House Atreides (1999), Dune: House Harkonnen (2000), and Dune: House Corrino (2001). The series is set in the years immediately prior to the events of Dune. This was followed with a second prequel trilogy called the Legends of Dune, consisting of Dune: The Butlerian Jihad (2002), Dune: The Machine Crusade (2003), and Dune: The Battle of Corrin (2004). These were set during the Butlerian Jihad, an element of back-story which Frank Herbert had previously established as occurring 10,000 years before the events chronicled in Dune. Herbert's brief description of humanity's "crusade against computers, thinking machines, and conscious robots" was expanded by Brian Herbert and Anderson in this series. With an outline for the first book of Prelude to Dune series written and a proposal sent to publishers, Brian Herbert had discovered his father's 30-page outline for a sequel to Chapterhouse Dune which the elder Herbert had dubbed Dune 7. After publishing their six prequel novels, Brian Herbert and Anderson released Hunters of Dune (2006) and Sandworms of Dune (2007), which complete the original series and wrap up storylines that began with Frank Herbert's Heretics of Dune. The Heroes of Dune series followed, focusing on the time periods between Frank Herbert's original novels. The first book, Paul of Dune, was published in 2008, followed by The Winds of Dune in 2009. The next two installments were to be called The Throne of Dune and Leto of Dune (possibly changing to The Golden Path of Dune), but were postponed due to plans to publish a trilogy about "the formation of the Bene Gesserit, the Mentats, the Suk Doctors, the Spacing Guild and the Navigators, as well as the solidifying of the Corrino imperium." Sisterhood of Dune was released in 2012, followed by Mentats of Dune in 2014. In a 2009 interview, Anderson stated that the third and final novel would be titled The Swordmasters of Dune, but by 2014 it had been renamed Navigators of Dune and was published in 2016. In 1985, Frank Herbert wrote an illustrated short work called "The Road to Dune", set sometime between the events of Dune and Dune Messiah. Published in Herbert's short story collection Eye, it takes the form of a guidebook for pilgrims to Arrakis and features images (with descriptions) of some of the devices and characters presented in the novels. Brian Herbert and Anderson have written several Dune short stories, most of them related to and published around their novels. The stories include "Dune: A Whisper of Caladan Seas" (2001), "Dune: Hunting Harkonnens" (2002), "Dune: Whipping Mek" (2003), "Dune: The Faces of a Martyr" (2004), "Dune: Sea Child" (2006), and "Dune: Treasure in the Sand" (2006). In 1984, Herbert's publisher Putnam released The Dune Encyclopedia under its Berkley Books imprint. Approved by Herbert but not written by him, this collection of essays by 43 contributors describes in invented detail many aspects of the Dune universe not found in the novels themselves. Herbert's estate later confirmed its non-canon status after Brian Herbert and Kevin J. Anderson had begun publishing prequel novels that directly contradict The Dune Encyclopedia. The 1984 Dune film spawned The Dune Storybook (September 1984, ISBN 0-399-12949-9), a novelization written by Joan D. Vinge, and The Making of Dune (December 1984, ISBN 0-425-07376-9), a making-of book by Ed Naha. In November 1984, Pocket Books published National Lampoon's Doon by Ellis Weiner (ISBN 0-671-54144-7), a parody novel. In May 1992, Ace Books published Songs of Muad'dib (ISBN 0-441-77427-X), a collection of Dune-related poems written by Frank Herbert and edited by his son Brian. Brian Herbert and Kevin J. Anderson released The Road to Dune on August 11, 2005. The book contains a novelette called Spice Planet (an alternative version of Dune based on an outline by Frank Herbert), a number of the Brian Herbert/Anderson short stories, and letters and unused chapters written by Frank Herbert. In 1973, director and writer Alejandro Jodorowsky set about creating a cinematic adaptation, taking over the option that producer Arthur P. Jacobs had put on the film adaptation rights in 1973 shortly before his death. Jodorowsky approached, among others, Peter Gabriel, the prog rock groups Pink Floyd and Magma for some of the music, artists H. R. Giger and Jean Giraud for set and character design, Dan O'Bannon and Douglas Trumbull for special effects, and Salvador Dalí, Orson Welles, Gloria Swanson, David Carradine, and others for the cast. He began writing a vast script, so expansive that the movie was thought to potentially last 14 hours. The project, nevertheless, was nipped in the bud for financial reasons, leaving Jodorowsky's unfinished handwritten script in a notebook that was partially published as a facsimile in 2012 as part of the 100 Notes – 100 Thoughts catalog of the 13th documenta exhibition. Frank Pavich directed a documentary about this unrealized project entitled Jodorowsky's Dune, which premiered at the 2013 Cannes Film Festival in May 2013, and was released theatrically in March 2014. In 1984, Dino De Laurentiis and Universal Pictures released Dune, a feature film adaptation of the novel by director and writer David Lynch. Although a commercial and critical failure upon release, Frank Herbert himself was reportedly pleased with the movie, as it stayed more faithful to the book than earlier movie adaptation attempts, although he had his reservations on its failures at the time, citing the lack of "imagination" in its marketing and estimated costs, and some of the filmmaker's production techniques. In 2008, Paramount Pictures announced that they had a new feature film adaptation of Dune in development with Peter Berg set to direct; Berg dropped out of the project in October 2009, and director Pierre Morel was signed in January 2010. Paramount dropped the project in March 2011. In November 2016, Legendary Entertainment acquired the film and TV rights for Dune. Variety reported in December 2016 that Denis Villeneuve was in negotiations to direct the project, which was confirmed in February 2017. In early 2018, Villeneuve stated that his goal was to adapt the novel into a two-part film series. He said in May 2018 that the first draft of the script had been finished. Villeneuve said, "Most of the main ideas of Star Wars are coming from Dune so it's going to be a challenge to [tackle] this. The ambition is to do the Star Wars movie I never saw. In a way, it's Star Wars for adults." In July 2018, Brian Herbert confirmed that the latest draft of the screenplay covered "approximately half of the novel Dune." Timothée Chalamet is to play Paul Atreides. Greig Fraser joined the project as cinematographer in December 2018. In September 2018, it was reported that Rebecca Ferguson was in talks to play Jessica Atreides. In January 2019, Dave Bautista and Stellan Skarsgård joined the production, playing Glossu Rabban and Vladimir Harkonnen, respectively. It was reported later that month that Charlotte Rampling had been cast as Reverend Mother Mohiam, Oscar Isaac as Duke Leto, Zendaya as Chani, and Javier Bardem as Stilgar. In February 2019, Josh Brolin was cast as Gurney Halleck, Jason Momoa as Duncan Idaho, and David Dastmalchian as Piter De Vries. Filming began March 18, 2019, and the film will be shot on location in Budapest, Hungary and Jordan. Warner Bros. will distribute the film, which will be released on November 20, 2020. Syfy (Sci-Fi Channel) premiered a three-part miniseries adaptation called Frank Herbert's Dune on December 3, 2000. Its March 16, 2003 sequel, Frank Herbert's Children of Dune, combined both Dune Messiah and Children of Dune. As of 2004, both miniseries were two of the three highest-rated programs ever to be broadcast on Syfy. Frank Herbert's Dune won two Primetime Emmy Awards in 2001, for Outstanding Cinematography for a Miniseries or Movie and Outstanding Special Visual Effects for a Miniseries, Movie or a Special. The miniseries was also nominated for an Emmy for Outstanding Sound Editing for a Miniseries, Movie or a Special. Frank Herbert's Children of Dune won the Primetime Emmy Award for Outstanding Special Visual Effects for a Miniseries, Movie or a Special in 2003. The miniseries was also nominated for Emmys for Outstanding Sound Editing for a Miniseries, Movie or a Special, Outstanding Hairstyling for a Limited Series or Movie, and Outstanding Makeup for a Limited Series or Movie (Non-Prosthetic). On December 1, 1984, Marvel Comics and Berkley published Dune: The Official Comic Book (ISBN 0-425-07623-7), a comic adaptation of David Lynch's film Dune. Marvel Super Special #36: Dune featuring an adaptation of the film by writer Ralph Macchio and artist Bill Sienkiewicz was released on April 1, 1985, as well as a three-issue limited comic series from Marvel entitled Dune from April to June 1985. The board game Dune was released by Avalon Hill in 1979, followed by a Parker Brothers game Dune in 1984. A 1997 card game called Dune was followed by the role-playing game Dune: Chronicles of the Imperium in 2000. 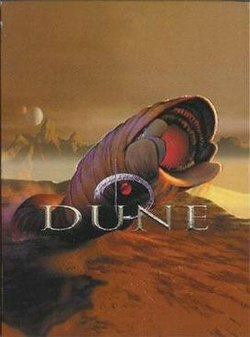 To date, there have been five Dune computer and video games released. Following Dune (1992), the most famous video game adaptation was Westwood Studios' Dune II (1992), which is credited for popularizing and setting the template for the real-time strategy genre of computer games. It was followed by Dune 2000 (1998), Frank Herbert's Dune (2001), and Emperor: Battle for Dune (2001). On February 26, 2019, Funcom announced that it was entering into an exclusive partnership with Legendary Entertainment to develop games related to the upcoming Dune films. Soundtrack albums have been released for the 1984 film, the 2000 TV miniseries, and the 2003 Children of Dune miniseries, as well as the 1992 video game, the 2001 computer game Emperor: Battle for Dune, and select tracks from the entire series of Dune video games. As explained in Dune, the Butlerian Jihad is a conflict taking place over 11,000 years in the future (and over 10,000 years before the events of Dune) which results in the total destruction of virtually all forms of "computers, thinking machines, and conscious robots". With the prohibition "Thou shalt not make a machine in the likeness of a human mind," the creation of even the simplest thinking machines is outlawed and made taboo, which has a profound influence on the socio-political and technological development of humanity in the Dune series. Herbert refers to the Jihad several times in the novels, but does not give much detail on how he imagined the causes and nature of the conflict. "The target of the Jihad was a machine-attitude as much as the machines...Humans had set those machines to usurp our sense of beauty, our necessary selfdom out of which we make living judgments. Naturally, the machines were destroyed." This technological reversal leads to the creation of the universal Orange Catholic Bible and the rise of a new feudal inter-galactic empire which lasts for over 10,000 years before Herbert's series begins. Several secret societies also develop, using eugenics programs, intensive mental and physical training, and pharmaceutical enhancements to hone human skills to an astonishing degree. Artificial insemination is also prohibited, as explained in Dune Messiah (1969), when Paul Atreides negotiates with the Reverend Mother Gaius Helen Mohiam, who is appalled by Paul's suggestion that he impregnate his consort in this manner. Herbert died in 1986, leaving his vision of the actual events of the Butlerian Jihad unexplored and open to speculation. The Legends of Dune prequel trilogy (2002–2004) by Brian Herbert and Kevin J. Anderson presents the Jihad as a war between humans and the sentient machines they had created, who rise up and nearly destroy humanity. The series explains that humanity had become entirely complacent and dependent upon thinking machines; recognizing this weakness, a group of ambitious, militant humans calling themselves the Titans use this widespread reliance on machine intelligence to seize control of the entire universe. Their reign lasts for a century; eventually they give too much access and power to the AI program Omnius, which usurps control from the Titans themselves. Seeing no value in human life, the thinking machines—now including armies of robot soldiers and other aggressive machines—dominate and enslave nearly all of humanity in the universe for 900 years, until a jihad is ignited. This crusade against the machines lasts for nearly a century, with much loss of human life but ultimately ending in human victory. The ancient Battle of Corrin—occurring 20 years after the end of the Butlerian Jihad—spawns the Padishah Emperors of House Corrino, who rule the known universe for millennia by controlling the brutally efficient military force known as the Imperial Sardaukar. Ten thousand years later, one balance to Imperial power is the assembly of noble houses called the Landsraad, which enforces the Great Convention's ban on the use of atomics against human targets. Though the power of the Corrinos is unrivaled by any individual House, they are in constant competition with each other for political power and stakes in the omnipresent CHOAM company, a directorship which controls the wealth of the entire Old Empire. The third primary power in the universe is the Spacing Guild, which monopolizes interstellar travel and banking. Mutated Guild Navigators use the spice drug melange to successfully navigate "folded space" and safely guide enormous heighliner starships from planet to planet instantaneously. The matriarchal Bene Gesserit possess almost superhuman physical, sensory, and deductive powers developed through years of physical and mental conditioning. While positioning themselves to "serve" humanity, the Bene Gesserit pursue their goal to better the human race by subtly and secretly guiding and manipulating the affairs of others to serve their own purposes. The Bene Gesserit also have a secret, millennia-long selective breeding program to bolster and preserve valuable skills and bloodlines as well as to produce a theoretical superhuman male they call the Kwisatz Haderach. By the time of Dune, the Sisterhood are only one generation away from their desired individual, having manipulated the threads of genes and power for thousands of years to produce the required confluence of events. But Lady Jessica, ordered by the Bene Gesserit to produce a daughter who would breed with the appropriate male to produce the Kwisatz Haderach, instead bears a son—unintentionally producing the Kwisatz Haderach a generation early. "Human computers" known as Mentats have been developed and perfected to replace the capacity for logical analysis lost through the prohibition of computers. Through specific training, they learn to enter a heightened mental state in which they can perform complex logical computations that are superior to those of the ancient thinking machines. The patriarchal Bene Tleilax, or Tleilaxu, are amoral merchants who traffic in biological and genetically engineered products such as artificial eyes, "twisted" Mentats, and gholas. Finally, the Ixians produce cutting-edge technology that seemingly complies with (but pushes the boundaries of) the prohibitions against thinking machines. The Ixians are very secretive, not only to protect their valuable hold on the industry but also to hide any methods or inventions that may breach the anti-thinking machine protocols. Against this backdrop, the Prelude to Dune prequel trilogy (1999–2001) chronicles the return from obscurity of House Atreides, whose role in the Butlerian Jihad is all but forgotten. The Imperial House schemes to gain full control of the Empire through the control of melange, precisely at the time that the Bene Gesserit breeding program is nearing fruition. As Frank Herbert's Dune (1965) begins, Duke Leto Atreides finds himself in a dangerous position; the 81st Padishah Emperor Shaddam IV has put him in control of the desert planet Arrakis, known as Dune, which is the only natural source of the all-important spice melange. The most valuable commodity in the known universe, the spice not only makes safe and reliable interstellar travel possible, but also prolongs life, protects against disease, and is used by the Bene Gesserit to enhance their abilities. The potential financial gains for House Atreides are mitigated by the fact that mining melange from the desert surface of Arrakis is an expensive and hazardous undertaking, thanks to the treacherous environment and constant threat of giant sandworms which protect the spice. In addition, Leto is aware that Shaddam, feeling threatened by the rising power and influence of the Atreides, has sent him into a trap; failure to meet or exceed the production volume of their predecessors, the vicious House Harkonnen, will negatively affect the position of House Atreides in CHOAM, which relies on spice profits. Further, the very presence of the Atreides on Arrakis inflames the long-simmering War of Assassins between House Atreides and House Harkonnen, a feud ignited 10,000 years before when an Atreides had a Harkonnen banished for cowardice after the Butlerian Jihad. The little-understood native population of Arrakis are the Fremen, long overlooked by the Imperium. Considered backward savages, the Fremen are an extremely hardy people and exist in large numbers, their culture built around the commodity of water, which is extremely scarce on Arrakis. The Fremen await the coming of a prophesied messiah, not suspecting that this prophecy had been planted in their legends by the Missionaria Protectiva, an arm of the Bene Gesserit dedicated to religious manipulation to ease the path of the Sisterhood when necessary. In Dune, the so-called "Arrakis Affair" puts unexpected Kwisatz Haderach Paul Atreides in control of first the Fremen people and then Arrakis itself; he deposes Shaddam and becomes ruler of the known universe. With a bloody jihad subsequently unleashed across the universe in Paul's name but out of his control, the Bene Gesserit, Tleilaxu, Spacing Guild, and House Corrino plot to dethrone him in Dune Messiah (1969). The Atreides Empire continues to devolve in Children of Dune (1976) as the religion built around Paul falters and his heirs rise to power. The Heroes of Dune series (2008–present) by Brian Herbert and Kevin J. Anderson follows events involving the Atreides before, between, and after Dune, Dune Messiah, and Children of Dune. At the time of God Emperor of Dune (1981), Paul's son, the God Emperor Leto II Atreides, has ruled the Empire for 3,500 years from the verdant face of a transformed Arrakis; melange production has ceased. Leto has forced the sandworms into extinction, except for the larval sandtrout with which he had forged a symbiosis, transforming him into a human-sandworm hybrid. Human civilization before his rule had suffered from twin weaknesses: that it could be controlled by a single authority, and that it was totally dependent upon melange, found on only one planet in the known universe. Leto's prescient visions had shown that humanity would be threatened by extinction in any number of ways; his solution was to place humanity on his "Golden Path," a plan for humanity's survival. Leto governs as a benevolent tyrant, providing for his people's physical needs, but denying them any spiritual outlets other than his own compulsory religion (as well as maintaining a monopoly on spice and thus total control of its use). Personal violence of any kind is banned, as is nearly all space travel, creating a pent-up demand for freedom and travel. The Bene Gesserit, Ixians, and Tleilaxu find themselves seeking ways to regain some of their former power or unseat Leto altogether. Leto also conducts his own selective breeding program among the descendants of his twin sister Ghanima, finally arriving at Siona, daughter of Moneo, whose actions are hidden from prescient vision. Leto engineers his own assassination, knowing it will result in rebellion and revolt but also in an explosion in travel and colonization. The death of Leto's body also produces new sandtrout, which will eventually give rise to a population of sandworms and a new cycle of spice production. In the aftermath of the fall of the God Emperor, chaos and severe famine on many worlds cause trillions of humans to set off into the freedom of unknown space and spread out across the universe. This diaspora is later called the Scattering and, combined with the invisibility of Atreides descendants to prescient vision, assures that humanity has forever escaped the threat of total extinction. At the time of Heretics of Dune (1984) and Chapterhouse: Dune (1985)—1500 years after Leto's death—the turmoil is settling into a new pattern; the balance of power in the Empire rests among the Ixians, the Bene Gesserit, and the Tleilaxu. The Spacing Guild has been forever weakened by the development of Ixian machines capable of navigation in foldspace, practically replacing Guild Navigators. The Bene Gesserit control the sandworms and their planet, now called Rakis, but the Tleilaxu have also discovered how to synthetically produce melange. This balance of power is shattered by a large influx of people from the Scattering, some fleeing persecution by an as-yet unknown enemy. Among the returning people, the Bene Gesserit finds its match in a violent and corrupt matriarchal society known as the Honored Matres, whom they suspect may be descended from some of their own sent out in the Scattering. As a bitter and bloody war erupts between the orders, it ultimately becomes clear that joining the two organizations into a single New Sisterhood with shared abilities is their best chance to fight the approaching enemy. ^ a b "SCI FI Channel Auction to Benefit Reading Is Fundamental". PNNonline.org (Internet Archive). March 18, 2003. Archived from the original on September 28, 2007. Retrieved September 28, 2007. Since its debut in 1965, Frank Herbert's Dune has sold over 12 million copies worldwide, making it the best-selling science fiction novel of all time ... Frank Herbert's Dune saga is one of the greatest 20th Century contributions to literature. ^ a b "The Hugo Awards: 1966". World Science Fiction Society. Retrieved March 8, 2011. ^ a b "1965 Nebula Awards". NebulaAwards.com. Archived from the original on December 17, 2005. Retrieved March 17, 2010. ^ Blue, Jennifer (August 4, 2009). "USGS Astrogeology Hot Topics: New Name, Descriptor Term, and Theme Approved for Use on Titan". Astrogeology.usgs.gov. Retrieved September 8, 2010. ^ "Gazetteer of Planetary Nomenclature: Titan Planitiae". Planetarynames.wr.usgs.gov. Retrieved January 3, 2015. ^ "Gazetteer of Planetary Nomenclature: Titan Labyrinthi". Planetarynames.wr.usgs.gov. Retrieved January 3, 2015. ^ a b c "Frank Herbert, author of sci-fi best sellers, dies". Pittsburgh Post-Gazette. February 13, 1986. Retrieved July 27, 2009. ^ a b Snider, John C. (August 2007). "Audiobook Review: Sandworms of Dune by Brian Herbert & Kevin J Anderson". SciFiDimensions.com. Archived from the original on May 13, 2008. Retrieved June 18, 2009. ^ Quinn, Judy (November 17, 1997). "Bantam Pays $3M for Dune Prequels by Herbert's Son". Publishers Weekly. Archived from the original on March 4, 2016. Retrieved February 6, 2014. The new prequels ... will be based on notes and outlines Frank Herbert left at his death in 1986. ^ "Dune 7 blog: Conspiracy Theories". DuneNovels.com. December 16, 2005. Archived from the original on October 12, 2007. Retrieved October 12, 2008. Frank Herbert wrote a detailed outline for Dune 7 and he left extensive Dune 7 notes, as well as stored boxes of his descriptions, epigraphs, chapters, character backgrounds, historical notes—over a thousand pages worth. ^ a b c Neuman, Clayton (August 17, 2009). "Winds of Dune Author Brian Herbert on Flipping the Myth of Jihad". AMCtv.com. Archived from the original on September 21, 2009. Retrieved March 31, 2014. I got a call from an estate attorney who asked me what I wanted to do with two safety deposit boxes of my dad's ... in them were the notes to Dune 7—it was a 30-page outline. So I went up in my attic and found another 1,000 pages of working notes. ^ a b "Before Dune, After Frank Herbert". Amazon.com. 2004. Archived from the original on April 9, 2009. Retrieved November 12, 2008. Brian was cleaning out his garage to make an office space and he found all these boxes that had 'Dune Notes' on the side. And we used a lot of them for our House books. ^ a b c d e Ascher, Ian (2004). "Kevin J. Anderson Interview". DigitalWebbing.com. Archived from the original on July 3, 2007. Retrieved July 3, 2007. ... we are ready to tackle the next major challenge—writing the grand climax of the saga that Frank Herbert left in his original notes sealed in a safe deposit box ... after we'd already decided what we wanted to write ... They opened up the safe deposit box and found inside the full and complete outline for Dune 7 ... Later, when Brian was cleaning out his garage, in the back he found ... over three thousand pages of Frank Herbert's other notes, background material, and character sketches. ^ Evans, Clay (March 14, 2008). "Review: Exploring Frank Herbert's 'Duniverse'". DailyCamera.com (Internet Archive). Archived from the original on March 19, 2008. Retrieved March 19, 2008. ^ Csicsery-Ronay, Jr., Istvan (November 28, 2008). The Seven Beauties of Science Fiction. Wesleyan. ISBN 0819568899. ^ Bahayeldin, Khalid (January 22, 2004). "Arabic and Islamic themes in Frank Herbert's Dune". Baheyeldin.com. Retrieved July 21, 2009. ^ a b Herbert, Frank; Herbert, Brian; Anderson, Kevin J. (August 11, 2005). "They Stopped the Moving Sands". The Road to Dune. Tor Books. pp. 263–264. ISBN 0-7653-1295-6. ^ "The Letters of Dune". The Road to Dune. Tor Books. 2005. pp. 276–280. ISBN 0-7653-1295-6. ^ "The Letters of Dune". The Road to Dune. Tor Books. 2005. p. 281. ISBN 0-7653-1295-6. ^ "Audio Book Review: Dune Messiah by Frank Herbert". Publishers Weekly. Retrieved October 2, 2018. ^ "The Hugo Awards: 1977". World Science Fiction Society. Archived from the original on May 7, 2011. Retrieved March 8, 2011. ^ Touponce, William F. (1988). "Herbert's Reputation". Frank Herbert. Twayne Publishers. p. 119. ISBN 0-8057-7514-5. When Herbert completed the third book of the series, Children of Dune (1976), it became an authentic hardcover best-seller with seventy-five thousand copies sold (not including book club sales). It was the first hardcover best-seller in the science fiction field. ^ Love, Jeff (August 16, 2013). "Dune: The Most Important Science Fiction Art Ever". Omni Reboot. Retrieved October 31, 2014. ^ Herbert, Frank (July 1980). "Dune Genesis". Omni. Archived from the original on January 7, 2012. Retrieved October 31, 2014 – via FrankHerbert.org. ^ "20th-Century American Bestsellers". The Bowker Annual/Publishers Weekly. LIS.Illinois.edu. Archived from the original on July 19, 2011. Retrieved January 5, 2010. ^ McDowell, Edwin (January 18, 1985). "Publishing: Top Sellers Among Books of 1984". The New York Times. Retrieved January 5, 2010 – via NYTimes.com. ^ Jonas, Gerald (June 16, 1985). "Science Fiction". The New York Times. Retrieved November 27, 2013 – via NYTimes.com. ^ a b c d e f MacDonald, Rod (January 6, 2009). "Review: Dune: The Butlerian Jihad by Brian Herbert & Kevin J. Anderson". SFCrowsnest.com. Archived from the original on June 15, 2013. Retrieved March 14, 2010. ^ "Kevin J. Anderson interview". Mir Fantastiki. Arrakis.ru. 2004. Archived from the original on September 8, 2012. Retrieved March 14, 2010. ^ a b Anderson, Kevin J. (April 14, 2008). "Dune blog". DuneNovels.com (Internet Archive). Archived from the original on June 20, 2008. Retrieved June 20, 2008. ^ Adams, John Joseph (August 9, 2006). "New Dune Books Resume Story". SciFi.com (Internet Archive). Archived from the original on June 15, 2008. Retrieved June 15, 2008. ^ "Product Details: Paul of Dune (Tor Books)". Amazon.com. September 16, 2008. Retrieved March 16, 2010. ^ Anderson, Kevin J. (March 23, 2007). "Sandworms of Dune blog". DuneNovels.com (Internet Archive). Archived from the original on October 29, 2007. Retrieved October 29, 2007. ^ "Product Details: The Winds of Dune (Tor Books)". Amazon.com. August 4, 2009. Retrieved March 16, 2010. ^ a b Anderson, Kevin J. (July 15, 2010). "Brainstorming THE SISTERHOOD OF DUNE". DuneNovels.com (Internet Archive). Archived from the original on May 18, 2011. Retrieved November 27, 2013. ^ Anderson, Kevin J. (November 25, 2014). "Brainstorming NAVIGATORS OF DUNE". KJAblog.com. Archived from the original on September 12, 2015. Retrieved April 6, 2016. ^ Herbert, Frank (1985). "The Road to Dune". Eye. ISBN 0-425-08398-5. ^ McNelly, Willis E. (June 1, 1984). The Dune Encyclopedia. ISBN 0-425-06813-7. ^ a b c d e f g "Dune-related Books". Arrakis.co.uk. Archived from the original on 2009-08-13. Retrieved March 16, 2010. ^ Touponce, William F. (1988). "Herbert's Reputation". Frank Herbert. Twayne Publishers. p. 124. ISBN 0-8057-7514-5. ^ Herbert, Brian; Kevin J. Anderson, Dr. Willis McNelly. "Frequently Asked Questions". DuneNovels.com (Internet Archive). Archived from the original on June 15, 2008. Retrieved June 15, 2008. ^ "The Dune Storybook (1984) by Joan D. Vinge". FantasticFiction.co.uk. Retrieved March 17, 2010. ^ "The Making of Dune (1984) by Ed Naha". FantasticFiction.co.uk. Archived from the original on January 7, 2010. Retrieved March 17, 2010. ^ "Songs of Muad'dib". FantasticFiction.co.uk. Retrieved August 11, 2008. ^ Herbert, Frank; Herbert, Brian; Anderson, Kevin J. (August 11, 2005). The Road to Dune. Tor Books. ISBN 0-7653-1295-6. ^ Jodorowsky, Alejandro (1985). "Dune: Le Film Que Vous Ne Verrez Jamais (Dune: The Film You Will Never See)". Métal Hurlant. DuneInfo.com. Archived from the original on April 29, 2011. Retrieved February 20, 2017. ^ Cantz, Hatje. "Alejandro Jodorowsky". Hatje Cantz. Retrieved May 16, 2014. ^ Keslassy, Elsa (April 23, 2013). "U.S. Fare Looms Large in Directors' Fortnight". Variety. Retrieved April 30, 2013. ^ Cecchini, Mike (August 25, 2013). "Jodorowsky's Dune Gets a Release Date From Sony". Den of Geek. Retrieved December 8, 2014. ^ "Dune (1984)". Box Office Mojo. Retrieved January 15, 2015. ^ Siegel, Tatiana (March 18, 2008). "Berg to direct Dune for Paramount". Variety. Retrieved February 15, 2019. ^ Roush, George (December 1, 2009). "Special Preview: El Guapo Spends A Day On A Navy Destroyer For Peter Berg's Battleship!". LatinoReview.com. Retrieved January 5, 2010. ^ Sperling, Nicole (January 4, 2010). "Dune remake back on track with director Pierre Morel". Entertainment Weekly. Archived from the original on January 14, 2010. Retrieved January 5, 2010. ^ Reynolds, Simon (March 23, 2011). "Dune remake dropped by Paramount". Digital Spy. Retrieved March 24, 2011. ^ Flemming, Mike (March 22, 2011). "Paramount ends 4 year attempt to turn Frank Herbert's Dune into film franchise". Deadline Hollywood. Retrieved December 16, 2011. ^ Busch, Anita (November 21, 2016). "Legendary Acquires Frank Herbert's Classic Sci-Fi Novel Dune For Film And TV". Deadline Hollywood. Retrieved November 27, 2016. ^ Kroll, Justin (November 21, 2016). "Legendary Lands Rights to Classic Sci-Fi Novel Dune". Variety. Retrieved November 27, 2016. ^ Kroll, Justin (December 21, 2016). "Blade Runner 2049 Helmer Denis Villeneuve Eyed to Direct Dune Reboot". Variety. Retrieved December 21, 2016. ^ Watters, Bill (February 1, 2017). "It's Official: The Dune Reboot Has Found Its Director". Bleeding Cool. Retrieved February 1, 2017. ^ Bui, Hoai-Tran (March 9, 2018). "At Least Two Dune Films Are Being Planned by Denis Villeneuve". /Film. Retrieved May 21, 2018. ^ Bui, Hoai-Tran (May 3, 2018). "The First Draft of Denis Villeneuve's Dune is Done, Pre-Production Begins 'Soon'". /Film. Retrieved July 16, 2018. ^ Lussier, Marc-Andre (May 9, 2018). "Denis Villeneuve: 'I'm relaxed, but I take my role seriously!'". La Presse (in French). Retrieved July 16, 2018. The director of Blade Runner 2049 has also revealed that a first version of the screenplay of Dune ... is now ready. ^ Taylor-Foster, Kim (January 16, 2018). "Dune Adaptation Will Be 'Star Wars for Adults' Says Director". Fandom. Wikia, Inc. Retrieved July 16, 2018. ^ Elderkin, Beth (July 25, 2018). "Denis Villeneuve's Dune Will Only Dive Into Half of the First Book". io9. Retrieved July 26, 2018. ^ Sharf, Zack (September 27, 2018). "Timothée Chalamet Raves About Dune and Denis Villeneuve: 'If You Do a Big Movie, Make Sure It's With a Great Director'". IndieWire. Retrieved December 11, 2018. ^ Sharf, Zack (December 6, 2018). "Roger Deakins Won't Be Working on Denis Villeneuve's Dune, Greig Fraser to Shoot". IndieWire. Retrieved December 11, 2018. ^ Kroll, Justin (September 5, 2018). "Rebecca Ferguson in Talks to Star Opposite Timothee Chalamet in Dune Reboot". Variety. Retrieved January 11, 2019. ^ McNary, Dave (January 9, 2019). "Stellan Skarsgard to Play Villain in Dune Movie". Variety. Retrieved January 11, 2019. ^ Kit, Borys (January 15, 2019). "Charlotte Rampling Joins Timothee Chalamet in Dune". The Hollywood Reporter. Retrieved January 29, 2019. ^ Galuppo, Mia (January 30, 2019). "Zendaya Circling Denis Villeneuve's Dune". The Hollywood Reporter. Retrieved January 30, 2019. ^ Kroll, Justin (February 1, 2019). "Javier Bardem Joins Timothee Chalamet in 'Dune' Reboot". Variety. Retrieved February 1, 2019. ^ Kroll, Justin (February 13, 2019). "Josh Brolin Joins Timothee Chalamet in Star-Studded Dune Reboot". Variety. Retrieved February 13, 2019. ^ N'Duka, Amanda (February 19, 2019). "Legendary's Dune Film Adds Ant-Man and the Wasp Actor David Dastmalchian". Deadline Hollywood. Retrieved February 19, 2019. ^ "Cameras Roll on Warner Bros. Pictures and Legendary Entertainment's Epic Adaptation of ‘Dune’" (Press release). Burbank, California: Warner Brothers. Business Wire. March 18, 2019. Retrieved 2019-03-19. ^ D'Alessandro, Anthony (February 16, 2019). "Warner Bros. Dates Dune For November 2020 & More". Deadline Hollywood. Retrieved February 16, 2019. ^ "Nominees/Winners (Outstanding Cinematography)". National Academy of Television Arts and Sciences. Retrieved February 1, 2019. ^ "Nominees/Winners (Outstanding Special Visual Effects)". National Academy of Television Arts and Sciences. Retrieved February 1, 2019. ^ "Nominees/Winners (Outstanding Sound Editing)". National Academy of Television Arts and Sciences. Retrieved February 1, 2019. ^ a b "Nominees/Winners (Outstanding Sound Editing/Hairstyling)". National Academy of Television Arts and Sciences. Retrieved February 1, 2019. ^ "Nominees/Winners (Outstanding Makeup)". National Academy of Television Arts and Sciences. Retrieved February 1, 2019. ^ "GCD :: Issue :: Marvel Super Special #36". ^ Baumrucker, MD, Steven (May 2003). "Dune: Classic CCG". Scrye. (Internet Archive). Archived from the original on May 3, 2004. Retrieved May 3, 2004. ^ Guder, Derek (April 19, 2001). "Dune: Chronicles of the Imperium Capsule Review". RPG.net. Retrieved March 18, 2010. ^ "D20 Product News: Dune". Wizards.com (Internet Archive). 2000. Archived from the original on January 24, 2001. Retrieved January 24, 2001. ^ Bates, Bob (2003). Game Developer's Market Guide. Thomson Course Technology. p. 141. ISBN 1-59200-104-1. ^ "Funcom N.V. enters into exclusive partnership with Legendary Entertainment for games in the Dune universe" (Press release). Funcom. February 26, 2019. Retrieved March 3, 2019. ^ "Frank Klepacki Dune Music - Dune - Behind The Scenes". Archived from the original on 2007-01-25. ^ Herbert, Brian; Anderson, Kevin J. (December 20, 2017). "Where to Start with the Dune Universe". Tor.com. Retrieved January 10, 2018. ^ Herbert, Frank (1965). "Appendix II: The Religion of Dune". Dune. Mankind's movement through deep space placed a unique stamp on religion during the one hundred and ten centuries that preceded the Butlerian Jihad. ^ a b Herbert, Frank (1981). God Emperor of Dune. ^ Torkos, Attila (2006-02-12). "Official site: Dune novels timeline". BrianPHerbert.com (Internet Archive). Archived from the original on 2012-04-13. Retrieved 2013-05-25. ^ a b Herbert, Frank (1969). Dune Messiah. ^ a b c d Herbert, Brian; Kevin J. Anderson (2002–2004). Legends of Dune. ^ Herbert, Frank (1965). Dune. We've a three-point civilization: the Imperial Household balanced against the Federated Great Houses of the Landsraad, and between them, the Guild with its damnable monopoly on interstellar transport. ^ Herbert, Frank (1965). Appendix IV: The Almanak en-Ashraf (Selected Excerpts of the Noble Houses). VLADIMIR HARKONNEN … the direct-line male descendant of the Bashar Abulurd Harkonnen who was banished for cowardice after the Battle of Corrin. ^ Herbert, Frank (1965). Dune. The Baron cannot forget that Leto is a cousin of the royal blood—no matter what the distance—while the Harkonnen titles came out of the CHOAM pocketbook. But the poison in him, deep in his mind, is the knowledge that an Atreides had a Harkonnen banished for cowardice after the Battle of Corrin. ^ Herbert, Brian; Kevin J. Anderson (2008–2009). Heroes of Dune. ^ Herbert, Frank (1984). Heretics of Dune. "Comprehensive timeline of plot events in the Dune series". DuneNovels.com (Internet Archive). Archived from the original on August 2, 2008. Retrieved September 23, 2009. Cobain, Craig T. (2002). "Frank Herbert". St. James Encyclopedia of Pop Culture. FindArticles.com. Retrieved March 17, 2010. Michaud, Jon (July 12, 2013). "Dune Endures". The New Yorker. Retrieved August 18, 2015. This page was last edited on 9 April 2019, at 04:24 (UTC).